Private law involves relationships between individuals, such as the law of contracts or torts (as it is called in the common law), and the law of obligations (as it is called in civil legal systems). 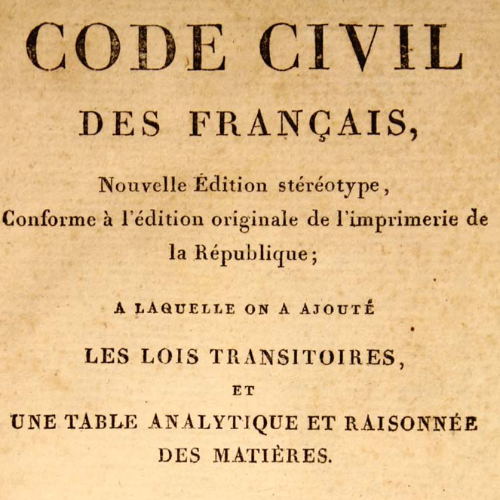 In general terms, private law involves interactions between private citizens, whereas public law involves interrelations between the state and the general population.¹ The picture on the right shows the Code Napoléon, notably the first extensive written code that deals with private law. Click here to go back to the Episode Guide. ¹ Definition provided by Wikipedia: http://bit.ly/2sgRjEZ. Maastricht Law Talk is a podcast about comparative law in a European context. Benedikt and his guests talk about the different areas of law and sometimes even day to day politics! Don't worry: No need to have any prior knowledge. We've got you covered!